Swedenborg enables us to understand why we were created, why we are alive, and what happens to us after our bodies die. Swedenborg enables us to have the best possible understanding of God’s message as it exists in those Bible books which constitutes God’s Word. Dr. King’s volume of Emerson does have extensive notes on Swedenborg. However, the handwriting is not his. There is an inscription that reads “Rev Wm Fairfax (colored) Swedenborgian minster”, with an address in New York. He is the likely author of the notes. 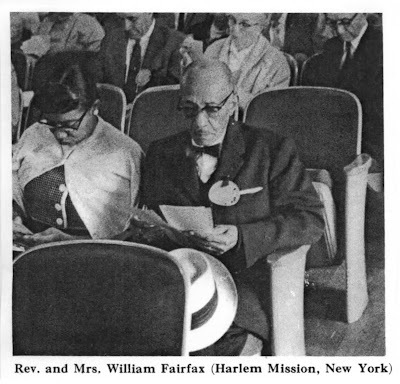 William E. Fairfax was ordained by Convention in 1937 and he served until his death in 1964. His church was in Harlem. .... Basically, what we know is that he probably identified in important ways with MLK, and thought he might interest MLK in his favorite theologian as a fellow "colored" Christian minister in the U.S. I also asked Jim where someone should start if they were interested in doing more research about Rev. Fairfax. He said, "Someone wanting to dig further on Fairfax would probably best start in our own collection here in Berkeley and the archives in Boston associated with our headquarters, which keeps a lot of records on the various societies past and present." As a Swedenborgian myself, I am now perhaps more interested in Rev Wm Fairfax than in MLKJ. I wonder who was Wm Fairfax? Ditto, Pearse. Though I am still interested in MLK and always will be. But who was Fairfax? Unfortunately, providing a scan of the work is problematic. Although Morehouse College owns the collection, and the library is the custodian, copyright is still maintained by the King Estate (PDF). At this time we cannot offer copies, or publish images of, the annotations in that volume. However, the Morehouse College Martin Luther King, Jr. Collection is open to the public for research, and we invite you, and other Swedenborg scholars, to view this volume at the Woodruff Library. If anyone does visit the collection and see the book or anything else interesting, please leave a comment with a description of your experience. I am much more fascinated that there was an African-American Swedenborgian minister named Rev Wm Fairfax. The New Church in the USA has seemed to me to have remarkably little diversity... it would be great to know more about this man and his work. hello who ever made the statement thier is little diversty in the new church was wrong thier is plenty of blacks that read swedenborg in all humbleness you talking to one. Fairfax's granddaughter (and I believe Weems's stepdaughter), the Rev. Gladys Wheaton, was ordained as a Swedenborgian minister in 1980. She is now largely retired, but was most recently pastor of the Swedenborgian Church in Newtonville, Massachusetts. It should also be mentioned that there is a relatively large (by Swedenborgian standards) New Church in South Africa, and smaller ones in other African nations such as Ghana and Nigeria. Whether Rev. King was inspired by Swedenborg, or whether he mirrored him by accident, it is indisputable that at least some of Rev. King's philosophy is strikingly similar to Swedenborg's. For instance, this statement, "Every person must decide, at some point, whether they will walk in the light of creative altruism or in the dark of destructive selfishness. This is the judgment. Life's most persistent and urgent question is, 'hat are you doing for others?'" certainly parallel's Swedenborg's thoughts. Why Did the Lord Have to Die?